VonShef might not be a household name in the UK, despite being a British company, but that doesn’t stop them manufacturing a range of quality kitchen appliances. The VonShef Premium Burr Grinder is one such product. This entry-level coffee grinder is a frequent appearance in the best buy coffee burr grinder lists, taking on much more expensive machines. Let’s have a look why in this VonShef Premium Burr Grinder review. Powerful 150W motor and burr grinder extracts maximum flavour and aroma for the tastiest coffee ever! 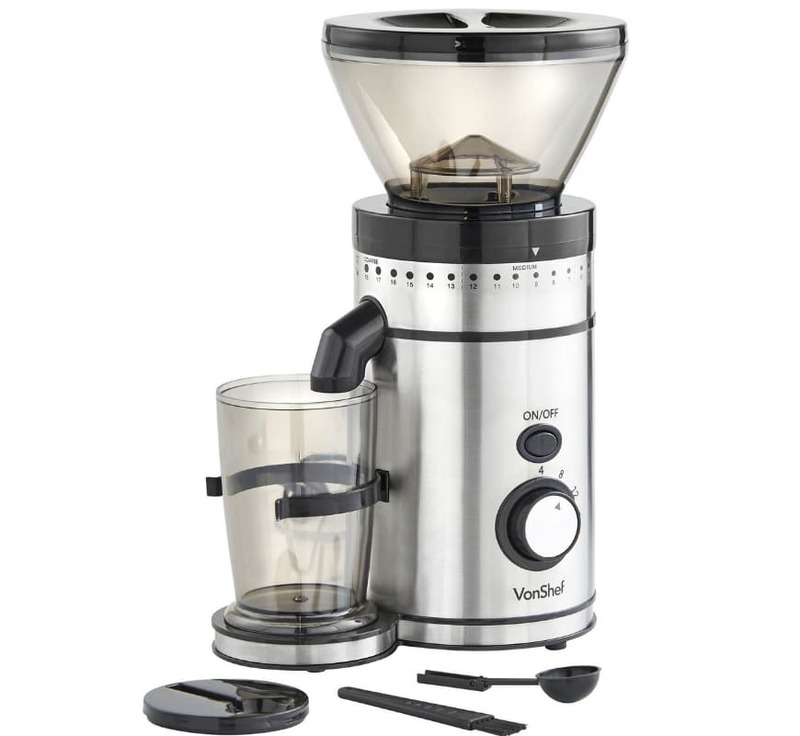 What is good about the VonShef Burr Coffee Grinder? For true coffee aficionados, your coffee beans have to be freshly ground every time. Every coffee lover has their preferred cup of coffee, and favourite brewing method. These will affect just how coarsely or finely you want your beans grinding. How many grind options does it have? This coffee burr grinder boasts an adequate eighteen different settings, from coarse to fine. The grind is selected using the dial at the top of the machine It’s labelled not only with numbers but with Coarse, Medium and Fine. One is the finest grind, eighteen the coarsest. What kind of brewing methods can I use? The VonShef Premium Burr Grinder produces ground coffee beans that are suitable for most coffee brewing methods, including cafetieres, percolators and filter machines. This VonShef coffee burr grinder offers a decent cup of coffee at a good price point. Holding an impressive 250g of beans, this machine grinds up to an impressive sixteen cups of coffee in one sitting. Reports say that it can produce eight cups worth of coffee grinds in just thirty seconds. The bean hopper is removable, so you can easily change beans should you decide it’s time for a different taste. The grind container is transparent, enabling you to see how much coffee the machine has ground so far, and how much coffee you have left when it comes to brewing your drink. It’s not really necessary as when the selected volume of coffee has been ground, the grinder automatically shuts off. The coffee grind container is also removable, for ease of use when it comes to making your drink. The VonShef Premium Burr Grinder has two dials and one button, making it simple to use. The dial around the top of the machine, just under the bean hopper, controls the grind coarseness. The small dial that sits below the on-off button selects the volume of coffee you want to grind, from four to sixteen cups. There are no indicator lights, but these would be surplus to requirements anyway. Although this is described as a premium burr grinder, the reality is that it’s an entry-level coffee burr grinder. The most frequent complaint about this machine is that, although the grind is consistent, it simply cannot grind the beans fine enough to make a really good espresso. There are also mentions of the funnel becoming clogged on the finer grinds. Other issues with the machine are that the cup selector is almost pointless. 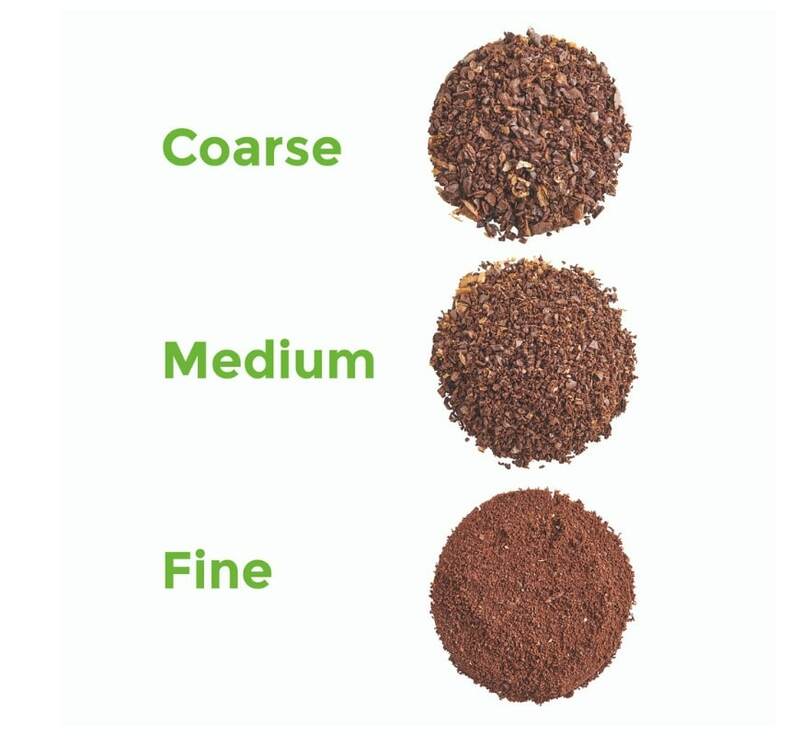 The four cup setting produces enough to make just over one full-sized cup, despite the manufacturers claiming that it should grind enough for four. More minor niggles are that the grind container lid is fiddly to get on, and the hopper lid doesn’t always stay on. Some describe the machine as messy, dropping coffee grinds around the container, as well as in it. It might also be worth noting that the machine doesn’t have a safety switch off function if the containers aren’t there or the lids aren’t on. However, the burrs are well protected by the hopper design. All of the major parts of this coffee burr grinder are removable for easy cleaning. To remove the hopper, turn the grind dial to the ‘hopper’ mark, and remove. 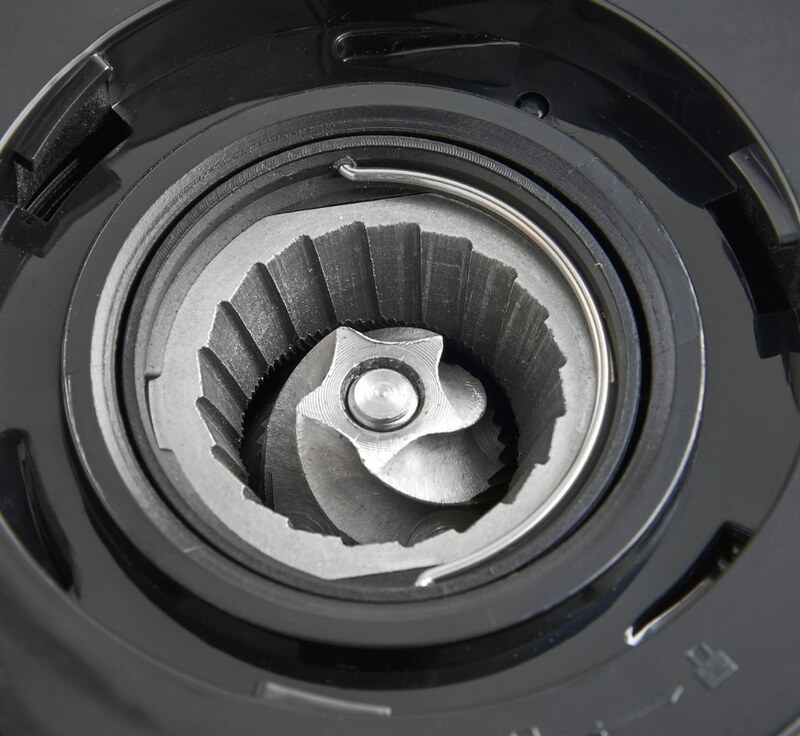 The burr can be removed by rotating it anti-clockwise, which users report is tricky to do. The hopper and container can be washed with soapy water, and a stiff brush is supplied as standard for cleaning the burrs. The burrs should never be washed to prevent corrosion. This coffee burr grinder is an entry-level machine. It performs its job, without offering any bells and whistles. Simple to use, the grinding stops automatically once the chosen coffee volume is produced without any need for further intervention once that button is pushed. As already mentioned, many people don’t consider even the finest grind to be suitable for making espressos. And perhaps starting with a minimum of four cups of coffee is a little excessive for those who want to make a single cup. The VonShef Premium Burr Grinder does what it’s designed to do, without any additional features. It offers a wide range of grinds and coffee volumes, but nothing else. But then, there’s no need for it to. This VonShef coffee burr grinder is surprisingly stylish for a basic machine. Despite its low price tag, it’s made of stainless steel, giving it a quality look that suits every kitchen. Perhaps the one criticism is that the plastic dials could look slightly more high end, but that’s a minor point. 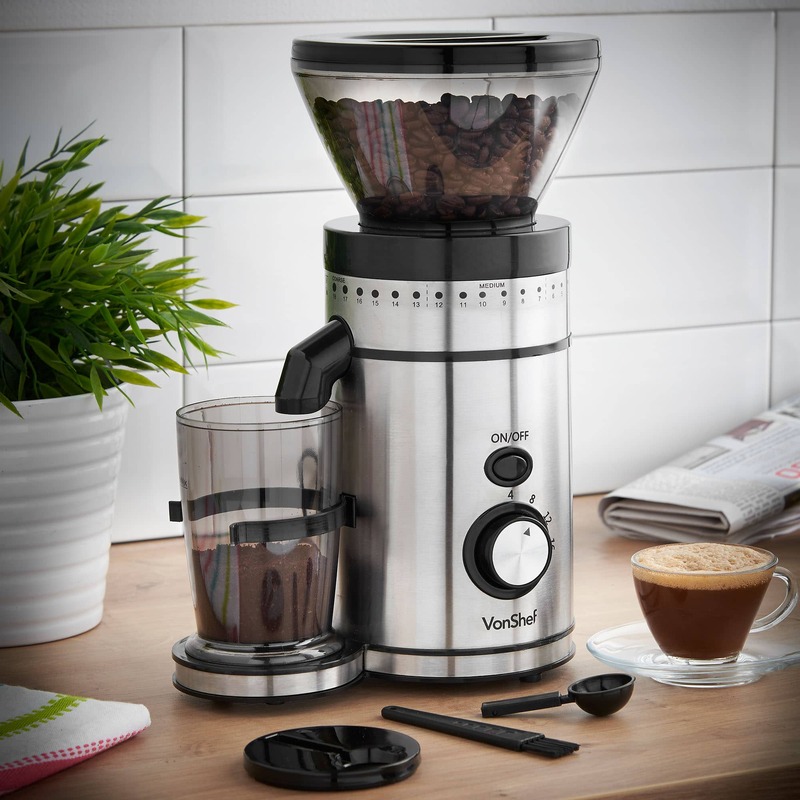 As this VonShef Premium Burr Grinder review has demonstrated, this coffee burr grinder is a good first step into the world of coffee bean grinding. It’s of higher quality than its price might suggest, even if it’s not perfect. 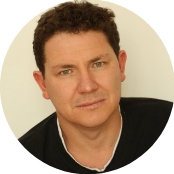 It’s simple to use, relatively easy to clean and does what it promises to do. However, for espresso lovers, this isn’t the machine for you. In line with many other entry-level coffee burr machines, this one doesn’t have high enough quality burrs to produce a grind fine enough to make a decent espresso coffee.